Threshold issue #20 is out! Issue #20 of the Threshold Magazine is available now! 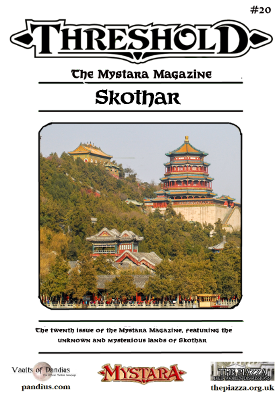 The Eastern Continent of Mystara is explored for the first time in these pages, highlighting and expanding all the fan works done so far to populate and develop Skothar! Travel to the lands of the rakasta, or discover the great Empires of the East, ready to leave their mark on the whole world. Search for the dangerous technomagic items of lost Blackmoor, or fight against those who try to seize them to spread devastation and terror! Discover hidden Beholder cities, the treasures of ancient Thonia and the ruins of the Duchy of Peaks. Face the Tigers of Kuraman, or escape from Returned Blackmoor! The immense plains, the great forests, the high mountains and the ancient ruins of Skothar wait for brave adventurers ready to face ancient secrets and new threats. Map of Skothar by Thorfin Tait, the newest map of the continent by our beloved Mystara mapper! History and people of Skothar by Sturm, a timeline of the continent using all the existing canon and fan resources. 3 Nations of Skothar by Arnden, an Almanac style description of Jen, Lhasa (M-Tibet) and Sian (M-Myanmar). Beholders of Mystara by Robin, about Beholders and their cities! Duchy of the Peaks by The Real Nowhere Man, a campaign through the History of the Duchy from Blackmoorian to modern times! Returned Blackmoor by Brian Rubinfeld, what if Blackmoor returns, powerful and evil, in present times? The Tigers of Kuraman by Agathokles, an adventure with rakasta pirates in the Gulf of Tangor. Playing Zhochal in Mystara by Geoff Gander, an alien, playable creature for your campaign. And look in the issue for the beautiful full page drawings made for Threshold by Justin Pfeil (History and Maps of Skothar) and Toni Roads (Returned Blackmoor). A heartfelt thank you goes out to all those who answered Threshold's call for support - editors, contributors and proofreaders! We hope that you enjoy reading through this issue as much as we enjoyed putting it together. Issue #21 will be about Specularum, see the Call for Contributors in the issue. As always, feel free to use this thread to send us comments and feedback on this issue. Re: Threshold issue #20 is out! I'll wait for the Stronghold issue (#23 march 2019) for my first contribution. Was it pushed back? For some reason I thought it was before Christmas. It was not pushed back, if I recall correctly, but you could also contribute to issue #22 if you prefer, maybe you were thinking that one? happy to have worked together with the others on this nice result. Moderator for Mystara. My moderator voice is heliotrope. My recollection was faulty. I'm not familiar anymore with BECMI. It would be too taxing to relearn its intricacies to write a proper adventure. Issue #23 «Strongholds» is something I can work on easily. As you prefer, but anyway note that Threshold does not require adventures or stats to be written according to BECMI rules, we had already articles which used AD&D, 3ed and 5ed stats for sure. The fanzine is about the setting and not the rules (even if obviously adaptation/expansions of BECMI rules are permitted and welcomed and have already been published in several artciles). Exactly. In the past we even hosted an article on updating the runes rules in Northern Reaches to newer editions, so there are very few limits, as long as the material is directly connected to Mystara. Oh! I'll think about it then. Definitive answer after August 6th. Our vacation will be over. I can work with that. I'll write an article about Solo Playing (no dm). It will be the synthesis of my recent experiences ironing out the kinks in my initial ideas for that style of play. It will be system agnostic. I think it fits the adventuring theme of issue #22. Is that ok with you guys? Massive, massive massive job by the historians and the cartographers... congratulations! I enjoyed a lot Returned Blackmoor as well and I really think I will run the Salgarian adventure in Tanogoro! If you do, let me know your experiences! While working on my article, I forgot to recommend one interesting item that could easily fit Skothar: Qelong by Kenneth Hite. I've got the PDF of this setting/adventure through a long-past Bundle of Holding (Old School Revival +2). Qelong is an hex-crawl (i.e., a sandbox adventure over a relatively large but isolated territory represented via an hex-map, much like the Isle of Dread), written using Lamentations of the Flame Princess, an OSR game, which makes relatively straightforward to adapt to BECMI (easier than, say, adapting a 3e or 4e adventure). Qelong is set in the eponymous land, which is heavily inspired by South-East Asia, including references to Apocalypse Now and the Vietnam War. Reviews of Qelong can be found here, here and here. But let's get to the main point, that is why Qelong is particularly suitable for inclusion in a Skothar campaign. The premise of Qelong is that the land is an innocent bystander in the war between two magical powers beyond the mountains. A magical weapon, the Cylinder, falls into Qelong and starts polluting the land with its radiation ("aakom"), which is poisonous when accumulated in a living being. Several parties (including the PCs) happen to be in Qelong, and some of them are interested in harvesting the power of the Cylinder. These parties include the Lotus Monks (mad monks that are the last remnants of the local religious orders), the Varangians (mercenaries from a Western-like land, complete with a flying transport), and the Myrmidons (humans taken over by an insectile hive mind). Some of these parties have an active role (e.g., the Myrmidons are migrating across the land, and the Varangians have their plans to harvest "aakom" and return home), which makes the campaign quite dynamic, while the otherwise stagnant realm makes it relatively easy for the DM to keep the overall picture under control. The Lotus Monks are simply evil Mystics. The adventure takes place in a single 72-miles hex, which can be placed anywhere in the Tangor Bay area (sufficiently near to Alphatia and Minaea to justify the presence of mercenaries from those regions, but sufficiently distant to have them stranded in Qelong and unable to return). It is designed to work with "western" PCs, so it can work out of the box with PCs from the Known World, Alphatia, or even Minaea or the Steppes of Jen, but can be easily adapted to work with more exotic PCs (e.g., Skotharian Rakasta). Last edited by agathokles on Sat Aug 25, 2018 11:44 pm, edited 1 time in total. Indeed it could fit perfectly! I really think I will run the Salgarian adventure in Tanogoro! I run twice this adventure (although both times with a different ruleset from D&D & Co.): the first time I run it as a one-off as it is written, handing over the pre-rolled characters to the players and it run fairly well, although with a fair feeling of railroading, but not too overwhelming. The second time (with another group) the players wanted to use their characters, so I enrolled them as Tigers of Kuraman and managed the other characters (Bahadur the Brave etc.) as NPCs, but the adventure turned out to be a bit clunky, as I had to hold Bahadur the Brave & Co. a bit back and let the Tigers have more autonomy, which made Bahadur the Brave a bit too much of a puppet. Said that, using a ruleset with quick fighting resolution mechanics, this adventure as presented can end extremely quickly (less than one hour easily) and it makes sense to call for the GM to beef it up! Wow! Thanks for the feedback! Did you have a chance to run it as well? How did it go? No, unfortunately this year I did not have the opportunity to play a one shot -- I generally do so only in conventions, since may home games are almost always long running ones. Indeed. Even for D&D, it is designed as a one shot with pregenerated characters. Playing the Tigers will necessarily feel a bit railroady, and the adventure is tuned to Companion level play, which in my experience can be quite slow.